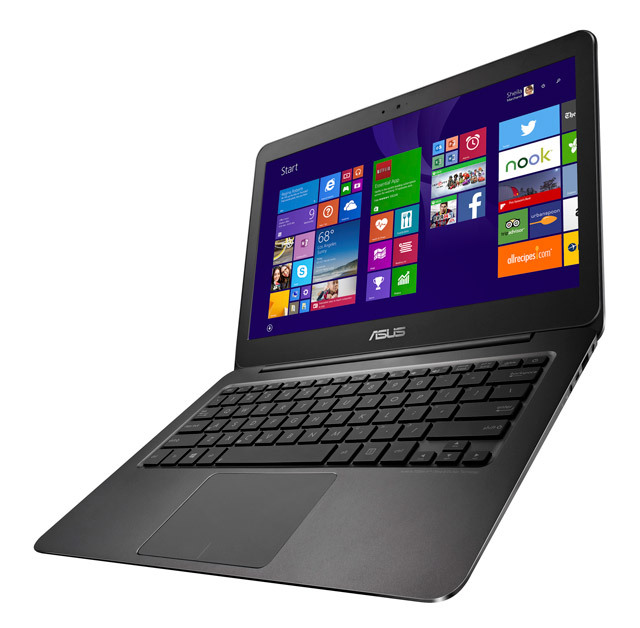 The Asus UX305FA is the first Zenbook to feature Intel’s new Core M technology. As a result, Asus clearly breaks tradition with previous Zenbook models, which were all equipped with much faster Intel Core i processors. On the upside, the new machine is a lot cheaper than most other Zenbooks. So, how does it compare to similar devices from competitive brands? To find that out, I used it for all sorts of typical home- and business-related tasks like browsing, communicating, handling documents and watching HD video. I also confronted the device with three tough benchmark tests and submitted it to two battery torture tests. The screen quality was measured with the help of dedicated equipment. Although Asus offers various configurations of the new Zenbook, the specific model I used for this review is the UX305FA-FC007H. It features an Intel Core-M5Y10 chip, 4GB RAM, 1 920×1 080-pixel screen and a 128GB SSD storage. Models with deviating specifications may produce different test results. Asus Zenbooks have a reputation of being one of the thinnest and most elegant notebooks money can buy, and with the UX305FA that remains true. Previous Zenbook models, like the UX32VD, suddenly look big and clumsy when placed next to the 12mm-thin UX305FA. Not only does the slim-line design look good, it also affects the weight of the device, which is only 1,2kg. The thinner a notebook gets, the more important a good and solid exterior becomes. It is what gives the device durability and robustness. To that end, Asus designed the Zenbook UX305FA with a complete metal casing that feels incredibly solid and rigid. It also gives the machine a premium look. At no point during our week with the UX305FA did it show any sign of bending, unlike most ultra-thin notebooks made of plastic. As a result of the solid, metal exterior, the machine delivers a pretty comfortable typing experience. It is well suited for hours of nonstop work on long documents. Too bad there is no keyboard backlight. It does have an integrated light sensor so its screen brightness will automatically adjust accordingly to save energy. The Zenbook UX305FA’s touchpad is equally comfortable to work with, even for long periods of time. It supports multi-touch gestures, which can be customised using bundled software. Despite the slim-line design, Asus managed to cram all sorts of connectors in the UX305FA. On the left side are two USB 3 connectors and an SD card reader. A third USB 3 port is located on the right side. This port can be used to charge other USB devices, even when the Zenbook UX305FA is turned off. There’s also a micro HDMI connector to hook the device up to an external screen. Unfortunately, there wasn’t enough space left to include an integrated Ethernet adapter on the Zenbook UX305FA. Instead, a USB to Ethernet adapter is included. You even get a simple but effective sleeve to protect the computer. Every new generation of Asus Zenbooks is traditionally fitted with the latest hardware and technology. In that light, the Zenbook UX305FA is based on the new 14nm Broadwell microarchitecture that is the result of Intel’s renowned Tick-Tock research and manufacturing model. The Zenbook UX305FA features an Intel Core M-5Y10 (dual-core) chip that operates at a base frequency of 0,8MHz/core and can briefly turbo-charge to 2GHz when needed. The UX305FA also has 4GB of DDR3 RAM, which is the absolute minimum for Windows 8.1 to be useful. For graphics, the UX305FA relies on an Intel HD 5300 GPU that is known for its ultra-low power consumption, but falls short in raw performance. Our review model was equipped with a (removable) 128GB Sandisk solid-state disk, but models with 256GB or 512GB of storage capacity are also available at a higher price. I also discovered that the 4GB of RAM on this specific review-model was soldered onto the mainboard, making future memory expansion a no-go. If you can afford it, Asus offers a version of the UX305FA with 8GB of RAM, making the device more futureproof. There’s also the option of a slightly faster Intel Core M-5Y71 chip that runs at a base frequency of 1,2GHz/core and that can briefly turbo-charge up to 2,9GHz when the situation requires it. To find out how all the hardware inside the Zenbook UX305FA translates into real-life performance, I ran a set of benchmark tests. In order to keep the comparison with other devices both honest and interesting I stacked the UX305FA up to similarly priced, as well as more expensive devices. I started the performance tests with PCMark 8, which is considered an industry-standard benchmark tool for the Windows platform. PCMark 8 accurately measures performance using real-world tasks and applications that reflect typical home and business use. 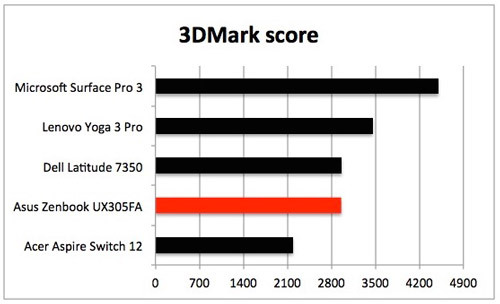 It showed me that the UX305FA not only managed to outperform the Acer Aspire Switch 12 (R13 000) and the Microsoft Surface Pro 3 (R13 000), but also the more expensive Lenovo Yoga 3 Pro (R25 000) and the Dell Latitude 7350 (R30 000). 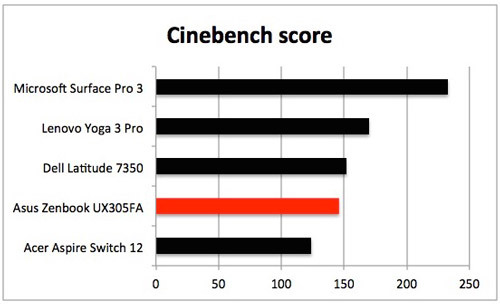 According to Cinebench, a program that primarily measures the maximum performance of the CPU and GPU during heavy workloads, the UX305FA definitely isn’t the fastest horse on the track. Finally, I used 3DMark, a test that not only focuses on heavy workload and processing intensive tasks, but also specifically measures complex 3D graphics performance. 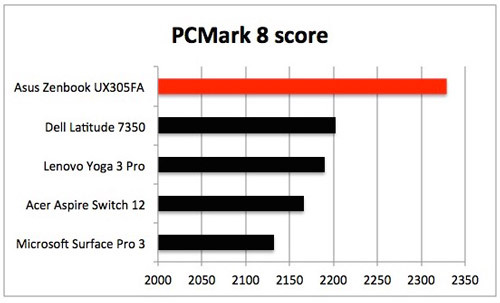 It resulted in the exact same ranking as initially produced by Cinebench. At the end, the performance delivered by the Asus Zenbook UX305FA can best be described as ideal for typical home and business activities, but not the best choice for heavy, processor intensive tasks. For that, the Microsoft Surface Pro 3 seems to be a much better candidate. The Asus Zenbook UX305FA is fitted with a relatively high-capacity 45Wh battery. Most of the other devices I used for comparison all have lower-capacity batteries: 36Wh (Aspire Switch 12), 42Wh (Surface Pro 3) and 44Wh (Yoga 3 Pro). Only the Dell Latitude 7350, that houses two separate batteries, has a slightly higher total capacity of 50Wh. The first battery test continuously plays a 1080p movie until there is no energy left. The second test simulates typical business activities like communicating, browsing and editing documents. Both torture tests aim to drain the battery as fast as possible, effectively creating a worst-case scenario — the minimum time you can expect the Zenbook UX305FA to function under two completely different user scenarios. 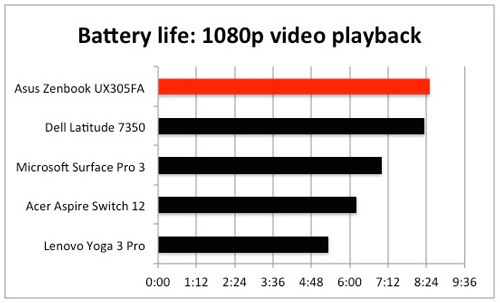 According to these tests, the machine can play a full-HD video nonstop for eight hours and 30 minutes, beating all the other devices I used in the comparison. Despite the fact that typical (continuous) home and business activities tend to strain the hardware a bit more, the UX305FA lasts even longer. According to the second torture test, the UX305FA can hold out for nine hours and 30 minutes while continuously being used for typical home and business tasks. Again, that’s longer than all the other devices and the best score of all Asus Zenbooks ever produced. Realistically, most people don’t use their computer for nine hours straight, so there will also be idle time when the device will blank its screen to save some energy. Based on that assumption, I calculated that the UX305FA should last for an impressive 11 hours and 45 minutes. In search for a plausible explanation for this impressive battery life, I discovered that the UX305FA uses a relatively new technology called panel self-refresh. Essentially, this technology shuts down the GPU and all associated circuitry when the screen image is static, like when reading a document. That way, precious energy can be saved, apparently resulting in longer battery life. 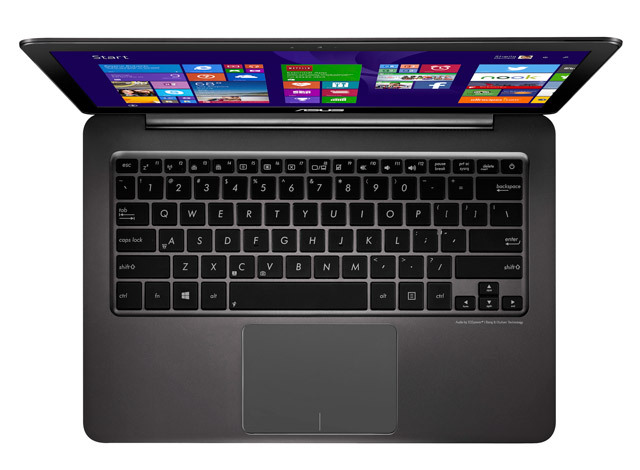 As mentioned earlier, the Asus Zenbook UX305FA is available in various configurations. The one I used for this review featured a 13,3-inch, 1 920×1 080-pixel, non-reflective display with a pixel density of 166ppi. For a higher price, Asus also offers a model with an increased resolution of 3 200×1 800 pixels and 276ppi. To determine the actual quality of the UX305FA’s screen, I used a Spectracal C6 Colorimeter to measure brightness, contrast and the ability to display colours accurately. It appears the Asus Zenbook UX305FA can display a maximum screen brightness of 374 candelas per square metre, which is quite high for a device like this. As a result, the UX305FA can comfortably be used in light-intensive situations, like during a bright and sunny day. Next up, its contrast. Again, I was positively impressed. The Asus Zenbook UX305FA was able to produce high contrast levels of 1 302:1, resulting in great looking and vivid colours. Good contrast values are great, but what about how accurate these colours are displayed? This is especially important for anyone who plans to use the Zenbook UX305FA for semi-serious image editing. To be blunt, on this particular aspect the UX305FA leaves plenty of room for improvement. To put things into perspective, though, the Intel Core M-5Y10 chip inside the UX305FA simply isn’t powerful enough for proper image editing. The 4GB RAM and 128GB SSD are also factors that make the UX305FA plain unsuitable for this task. Keeping that in mind, the lack of accurate colour reproduction won’t pose a big problem. The relatively cheap Asus Zenbook UX305FA has proved to be an impressive piece of work that not only looks good but is also very thin, durable, lightweight and surprisingly comfortable to work with. 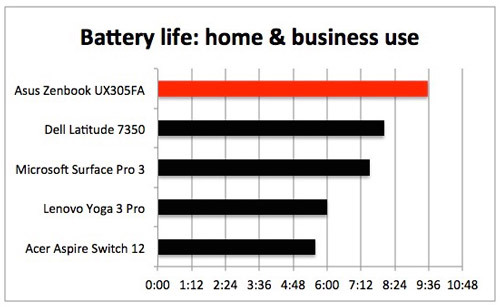 Although it can’t impress with high computing performance, the superb battery life more than makes up for that. To top it all off, the UX305FA offers an excellent, non-reflective screen and has plenty of USB connectors to hand. It’s a shame that the internal memory isn’t expandable, making it less futureproof than other devices. Nonetheless, the UX305FA is a great device and an affordable choice for anyone who is looking to buy a notebook that won’t be used for heavy tasks like gaming or image editing.